It's not like we're in love with multitasking, but the list of things to do before casting off does not seem to be getting any shorter. You can spend three days on a single task from that list, and when you're done you only get to cross one measly line off. It's not fair. Neither is spending the summer without my beloved Jack the doglet, but it's the only fair thing for him if we are going to be out in big water with high waves, cold spray, long hours and no dog pee breaks. So I flew him (in the cabin, of course) to Alaska to be looked after by someone who knows and loves him, until September. 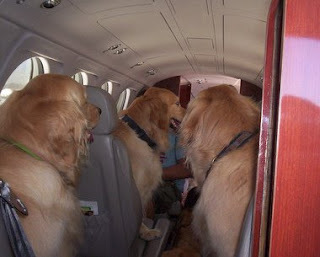 The flight crew was extremely friendly (see photo) and Jack did fine. Many kleenexes later I am back in PT and feeling overwhelmed by the list of things to do. I mean, it's HUGE. Finish painting the house, including the porch. Do some repairs that shouldn't wait. Move personal stuff out of the house for the new tenant. Organize the garage. Get bill-paying on autopilot for the next 5 months. Get summer stuff moved to the boat. Inventory and organize charts. Test-sail the new staysail and storm trysail. Buy enough food staples to last a long time between grocery stops in the wilderness. Figure out where to pack it all in and not sink the boat. On and on it goes. And Jim has a list, too. What does one do with such a pile? Conquering the temptation to sit down and navel-gaze, we have found the answer: Combine them, and make a List of Lists. NOW we can get organized! Anyone who has endured pre-departure voyage preparations will understand this minor rant. It's the boring, busy, stressed, tiresome, expensive chores that must be done to keep the shore-based loose ends of your life spinning smoothly while you disappear for a third of a year and enjoy the fruits of all that labor. The boat-based chores were fun. Bills and paint and repairs are not. But the finish line is somewhere out there. The List of Lists will tell us when it's visible. Jim and I have been approached by a sponsor we've never heard of, but are considering their offer. The Friends Of Obese Landlubbers have asked us to sail around the world and document everything we consume along the way. This includes all beer and wine. It's a calorie consumption-versus-endurance race, designed to inspire weight loss and toning via everyday isometric exercises, such as the ones you'd employ on a boat at sea. They are offering to equip the boat with a satellite tracker so you can follow our position. The only hitch is that we must sail backwards, e.g. stern first. This will significantly slow us down. However, we own two Dana 24s, and that means we own two pointy ends. We are looking into the possibility of hitching the boats together, stern-to-stern, so that we will have a bow after all. This would turn the boat into a double-ended schooner with a huge center cockpit and a bar at either end. We will keep you informed of our progress with the Friends Of Obese Landlubbers, whose motto is "All Progress Rarely Is Linear."